“Breathtaking. It took just two years for Jeremy Hunt to completely wreck our NHS,” writes Dr Eoin Clarke on Twitter. And to stave off those readers who may want to take issue with the claims (you know who you are), here are the facts to support them. It feels like the govt of the UK is careering out of control heading for disaster. The NHS is one we can see, it has been documented, and it is truly a disaster. What we can’t see is just as bad, the individuals, behind closed doors who can no longer carry the burden of Austerity. How do we get them out before it is too.late? Mike, I did not have an issue with your claims but I don’t like making claims that I can’t back up, on behalf of someone else. My own claims, people can take ’em or leave ’em. As it happens you had the link I needed and it substantiated all you had claimed. I did say that it wasn’t that I did not believe you when I asked for a link. I read your blog precisely because it contains info. that I haven’t found out before. I’m not taking issue with anybody. But what can we actually do!? It’s unthinkable that the government is allowed to continue for yet another five years. It is all very deliberate and malicious. 2 years to ‘completely wreck’ our health service?!! That means that if I ask for my 92 year old father to see his GP, that he’ll never get an appointment. In fact, last week, we only had to wait 1.5 hrs to get one. If you want to make a valid point, for goodness sake be sensible about it. I for one now find it hard to take anything that you say seriously. The fact that Hunt (and Lansley, with the support of Cameron, the Conservative Party, and let’s not forget the Liberal Democrats) has created huge financial problems for the NHS in England has little or no bearing on its day-to-day operation. Look at all the businesses that keep going as normal until suddenly it is announced that they have gone to the wall. We all know the plan for the NHS – make it look unsustainable and privatise it. At least we can all see it and lay blame where it belongs – the Tories (and Lib Dems). And, because it is a public service, there’s still time to put this right. But you don’t really care about that, do you? You were just looking for an excuse to try to trash This Blog and myself. I’m willing to bet that plan won’t work. @Paul J 1.5 hours! it takes me 4 weeks before I can see my Dr, obviously you live in some remote village with a small population, or else you know something or someone I don’t know. I believe you’re the one that needs to be sensible and take your head from up your arse, fool. On this site we play the ball, not the other player. Absolute rubbish. 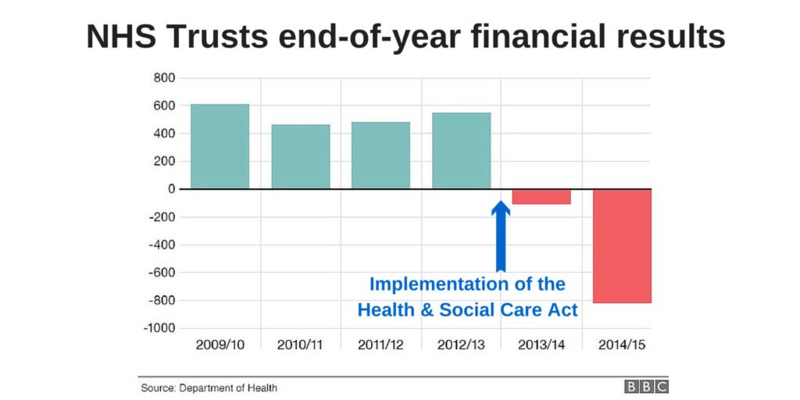 The NHS finances have been on terminal decline for years. Wastage in the NHS is frightening. Typical public sector lack of accountability with public money so no-one cares. One of the most bizarre situations is when a NHS trust can’t directly recruit a consultant for example so have to use agencies where miraculously consultants/doctors are queuing up to bleed the NHS dry. Wastage is the big reason why the NHS is skint….the answer is to start giving the managers of these NHS trusts bonuses linked to how much money they save and they will sort wastage out in no time – guaranteed. Firstly, these are official figures. Secondly, the agency issue is well-known. Thirdly, the answer isn’t to go around giving people bonuses for saving money because they’ll carry on cutting the people who do the actual work? Haven’t you heard the joke about the NHS boat race? Mike, I think we all know public sector organisations waste money – no-one cares…its not there’s, they get paid anyway so lets just spend. There needs to be an incentive to reduce costs and at the minute there simply isnt any and there are a lot more ways to save money than by cutting jobs. You seem to be deliberately avoiding the point. The NHS is being pushed into debt because that will make it easier to privatise. The figures show that, prior to Tory interference, the service in England was perfectly capable of running within its budget. What’s happening now is because Hunt and his forerunner Lansley interfered, and were supported by the Conservatives and Liberal Democrats. Pretty much every international comparison shows the NHS to be the most efficient or among the most efficient systems delivering health interventions. You can do a quick search to find this. I’d of course be interested in evidence to the contrary. Yes there are still glaring inefficiencies to be addressed but many of these actually appear to have come from the imposition of internal markets etc. The narrative that the NHS is particularly inefficient is clearly a lie and appears to be a deliberate part of the attempt to sell it off. The proposed alterative is largely based on a US model well known for its incredible inefficiency. Destroyer – You only have to compare our health care costs with the USA – The private ( profit making ) system there is far FAR more expensive than our NHS – So, yes, the NHS is not 100% efficient and perfect – BUT as far as value for money for its customers ( US!) is, is way ahead of what we would get if your / the tories scheme of privatising went ahead. Well done for pointing this out, Mike. It needs to be noted and seen by all. There is, however, a bigger issue here, and that is that the Conservative Party has always oscillated between antipathy to outright hostility when it comes to the NHS. The historical precedence needs to be highlighted far more in order to contextualise and illustrate precisely what is going on. The fact of the matter is that the Conservative Party, and in particular its backbenchers, wanted to kill the still infant NHS in the 1950s and then, as now, they looked to fiscal viability. This was, then, a logical move — teething problems regarding NHS budgets had actually played a major role in bringing down the Labour Government. As such the Conservative’s introduced the Guillebuard Committee which was created in anticipation that its findings would be that the NHS was a money pit. So assured were they, steeped in their rightwing ideology, that they would get the ammunition to kill the NHS, they made the foolish move of not rigging the outcome. Instead, they appointed the Cambridge economist CW Guillebuard who, in turn, consulted the likes of the leading social policy research Richard Titmuss. Unfortunately for the Tories, in 1956 Guillebuard reported the truth, that actually the NHS saved money and, if anything, should receive greater investment. The backbenchers in the Tory Party were outraged and miserable. They were denied the opportunity to kill the NHS, so they instead changed tack and began a policy of containment. It is interesting to note that when Thatcher waged her own war against the NHS in the late 1980s was careful not to call on an impartial committee to investigate — instead she formed a ministerial group, which she chaired, which claimed, that ‘the NHS has become a bottomless financial pit’. Amazingly, Thatcher’s plans were stymied by the Chancellor Nigel Lawson, who quite correctly noted that compared to virtually all other major western healthcare systems, the NHS performed well and at low cost. In short, the Chancellor wanted to avoid a headache for the Treasury precisely because he knew full well that, regardless of ideology or popularity, that the NHS saved money. Doubtless, however, he would have sided with Thatcher if a viable alternative was proposed — he was Tory minister after all. Thatcher was, naturally, furious. But by the late 1980s her grip on power was sliding. This is where the material you post here comes in. Clearly, the Tories have always looked for ways to either kill, diminish or contain the NHS and always had its demise at the back of their minds. This latest set of policies is merely a new strategy to achieve the same thing: defund then privatise. I have 2 questions. To whom is the NHS in deficit too and why have you made up a graph and not used the one in the article you refer to for confirmation? Yours looks completely different? 1. It isn’t a deficit – it’s a debt. They are spending more than they have in their bank accounts. 2. I haven’t made up any graphs. As far as I remember (and I could be totally wrong) the ‘NHS’ isn’t in debt to anyone and it’s certainly not bankrupt as the article claims. There’s a huge difference in business (and personal finances) between bankruptcy and spending more than you earn. As an individual you can spend more than you earn if you borrow or have savings. As a business (or as the NHS) the same applies. The NHS ran at a surplus for years so can afford to spend more than it brings in. That’s nothing like bankruptcy. You can read artciles going back 30 years that the NHS is in crisis (you can Google that term and go back at least a decade) and guess what… it’s still here. Okay – I may be wrong, but my understanding is that any surplus money that went unspent by the NHS was clawed back by the government of the day. It exists on a year-by-year basis and is expected to run on the money provided for it in any particular year. So you’re wrong in your assumption that the NHS can spend more than it receives (and remember, it doesn’t bring in any money at all – it is entirely funded by the government). That is why so many English NHS trusts are now in the red. As for going bankrupt – I suppose the only answer is to wait and see. The government do not fund the NHS. I as a TAX PAYER along with millions of other working people fund the service. More to the point, we want our money to be spent on a good and efficient NHS ,so if this government mucks about with it we will vote them at the next election. You fund the government; the government funds the NHS. If it were as you suggest, then we would all be making decisions about the amount of money being spent. We’re not. That being said, I agree that we want our money spent on a good and efficient NHS. This government HAS been mucking about with it since 2012, so by rights we should have got rid of the Tories in May last year. About 10 years ago (while working for the NHS) I attended a lecture at the Kings Fund which included a steeply rising graph of the cost of the NHS. If it continued to follow the same trajectory, the NHS would consume the entire tax take for the whole country! The current crisis was predicted. The reasons are recognised to be an expansion in effective treatments for diseases, especially chronic diseases, and the rising population, especially older people (like me). I think that a partial solution lies in getting rid of the layers of NHS management. I would include abolishing the Dept of Health! We don’t need it as well as NHS England to run the NHS. Perhaps NICE ( the decision maker on clinical treatments) and QCC (the Quality Care Commission) could be reduced in size and scope or combined. Recently, a small physiotherapy department that I attend as a patient was inspected by the QCC. This took several days and 11 inspectors!! It was a routine inspection (which the department passed) not an investigation into a problem. There are numerous bodies and committees funded by the NHS that really are not a good use of money. To whom would the NHS be accountable if not a democratically-elected government? The NHS already faces accusations that it unlawfully kills, with terrifying regularity. Don’t be too keen to restrict its accountability. I think the destroyer is well named the bonus culture has been a disaster in everything its been tried in, managers manipulate and spend hours arguing who budget is this on? it leads to short termism I have seen it in action. The cleaning of hospital wards is a prime example, the services put out to private tender. On paper saving money,£ 240 million apparently give those guys a bonus.Now these people were the worst paid in the uk so where is the money saved? I talked to cleaners who had no disinfectant in their cleaning fluid ,just water to save costs the result MRSA , cost to nhs two billion ( conservative estimate) to put right years later.The NHS is fantastic but is hated by those who value only money, it is obvious ( in fact the health sec wrote a book on it ) what the plan is.